Today, the University of Hertfordshire awards Michelle Mone OBE, founder of MJM International and Ultimo an Honorary Doctor of Arts in recognition of her outstanding contribution to the development of entrepreneurship in the fashion industry and for her tremendous achievements as a businesswoman. 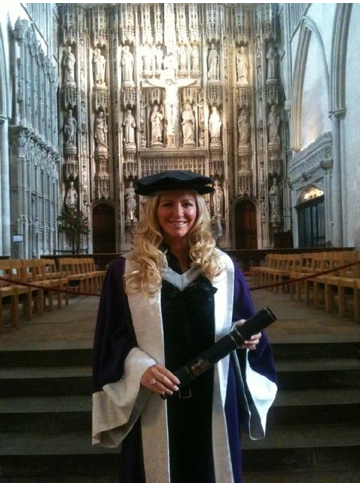 At the ceremony on Thursday 18 November – held in the Cathedral and Abbey Church of St Alban – Michelle received her Honorary Degree alongside 4300 new graduates celebrating academic success with their proud parents and friends. “Throughout my 14 year career in business, building up MJM International and the Ultimo brand, I’ve remained committed to supporting young aspiring entrepreneurs and enterprise, because I’m passionate about business, about raising aspirations and about building a stronger, enterprise-led economy. This week, the University will also show its appreciation to fifteen other pillars of the community by awarding Honorary Degrees and Fellowships for outstanding contribution to academic disciplines, charity, professions or public service – presented by Lord Salisbury, Chancellor of the University of Hertfordshire; Mrs Jo Connell, Pro Chancellor of the University and Professor Tim Wilson, Vice-Chancellor. Since launching Ultimo back in 1999 Michelle has grown her business, MJM International to become one of the UK’s most prominent and successful lingerie companies. Michelle is also a committed supporter of young budding entrepreneurs and sits on the board of the PSYBT. Welcome to the Ultimo Lingerie Blog! For all the latest news, fashion, and events for everything Ultimo, this is the place to be! Posted in The Fashion Collection, Welcome and tagged blog, fashion, news and events, ultimo, welcome on November 3, 2010 by ultimoeditor.